Monogrammed Tote Bags to hold Christmas gifts. I used the letters I already had cut out from the Rag Quilt Letters. *PS: Found the totes on sale at Micheal’s. Not too inspired on my ornaments for the family ornament exchange. 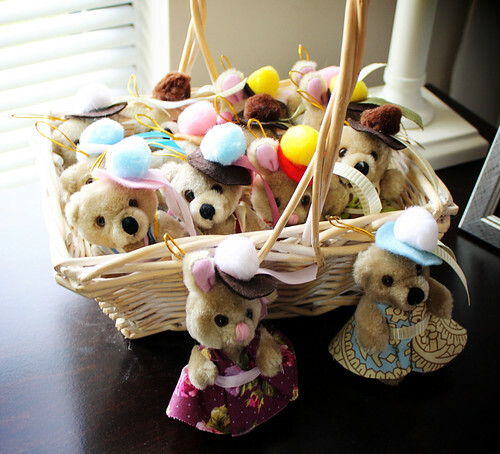 Just dressed up some bears and bunnies. I do love their hats though. did you make your bags as well? if so, how? or did you buy those? if so, where? I’m glad you’re having fun with friends today! Fun! I love those monogramed bags, so cute! I love the idea of tote bags as gift bags to hold the actual present. And I love how you monogrammed them as well!!! You are so creative!!! I love those tote bags, they would make such great Christmas gifts! Where did you find the bags? Adorable bags! Did you make the bags or purchase them? They would be great for my neices and nephews, and teachers, too! LOVE THESE!! What a great gift idea and the bears are just too cute! The tote bags turned out great! Hi! I’ve been a “lurker” for a while now, so I decided it’s time to show myself! I absolutely love the idea of these monogrammed totes filled with coloring books or notebooks for Christmas. Did y ou make the actual totes yourself or just buy them? If so, do you have a pattern or can you tell me where to buy them. Thanks! Hi all 🙂 I found the tote bags at Micheal’s for a super good deal. 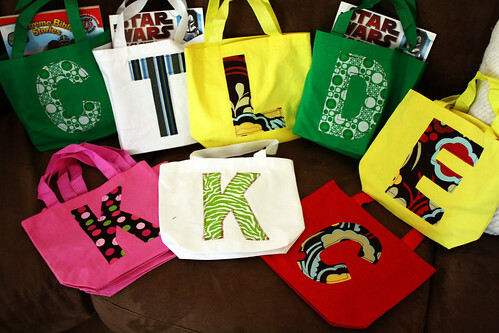 Your totes turned out so great! We have been trying to eliminate commercial gift wrap from our lives (it can be so wasteful! ), and your bags are a great way to personalize and wrap a present! Thank you for the great idea! great ideas with those bags… something easy, yet thoughtful!